Every great artist started out as a kid. Forget the awards, the sold-out museum exhibitions, and the timeless masterpieces. When the world’s most celebrated artists were growing up, they had regular-kid problems just like you. Jackson Pollock’s family moved constantly—he lived in eight different cities before he was sixteen years old. Georgia O’Keeffe lived in the shadow of her “perfect” older brother Francis. And Jean-Michel Basquiat triumphed over poverty to become one of the world’s most influential artists. 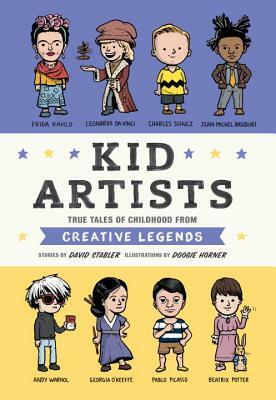 Kid Artists tells their stories and more with full-color cartoon illustrations on nearly every page. Other subjects include Claude Monet, Jacob Lawrence, Leonardo da Vinci, Vincent van Gogh, Pablo Picasso, Frida Kahlo, Beatrix Potter, Yoko Ono, Dr. Seuss, Emily Carr, Keith Haring, Charles Schulz, and Louise Nevelson.